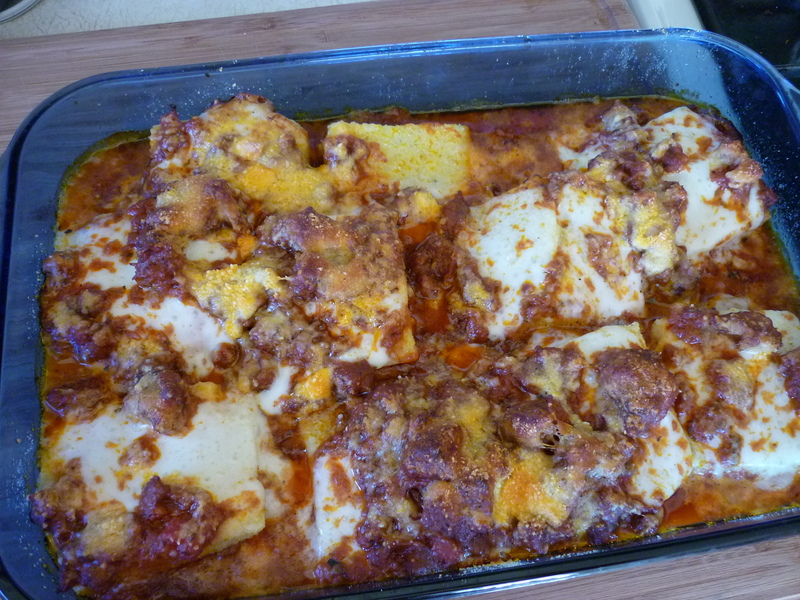 You are currently browsing the tag archive for the ‘polenta’ tag. 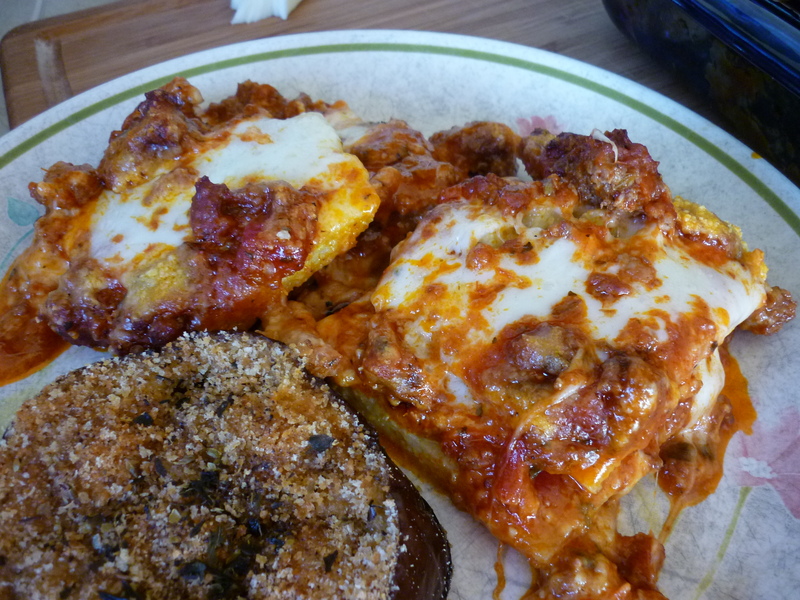 Polenta is a good idea when you’re tired of the usual starchy dishes. It is basically corn meal mush allowed to firm up. It is then sliced and used as a base for sauce and/or cheese. 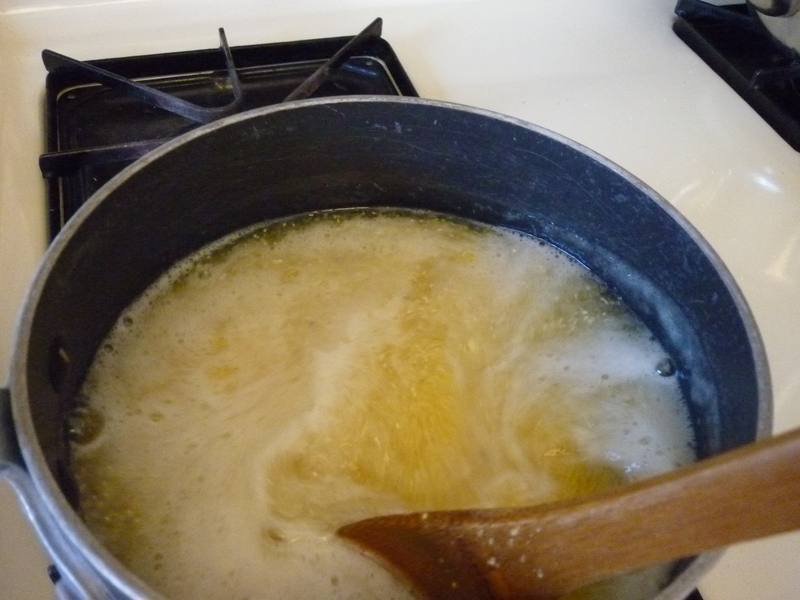 Bring water to a rolling boil and very slowly sprinkle polenta into the water while stirring all the while. Reduce the heat once it comes back to a boil. Continue stirring while the polenta simmers. As it thickens it begins to splatter. Once it’s fairly thick, it’s okay to leave it for a couple minutes at a time, so stir frequently instead of constantly. A spatter guard is a huge help. The process of simmering and stirring takes about 25 minutes. The polenta should be quite thick. 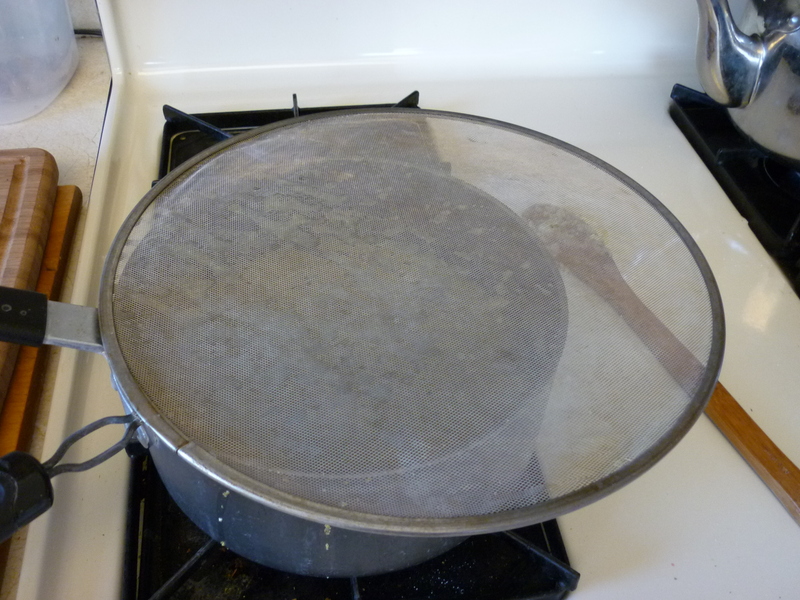 Coat a 8×8″ square pan with olive oil and pour the polenta into it. Smooth out the top with a spatula as best you can. Once it’s cooled a little, place it into the refrigerator for an hour or longer. 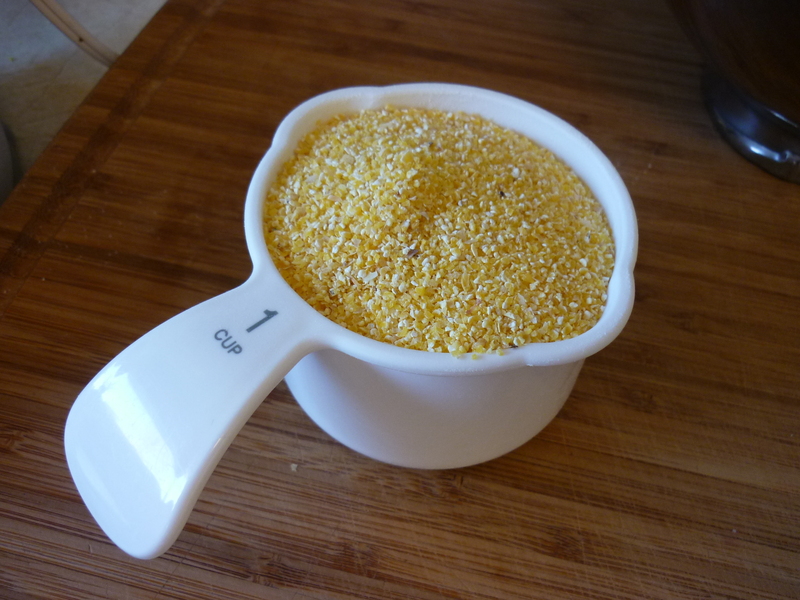 Polenta is a much larger and rougher grind than corn meal. 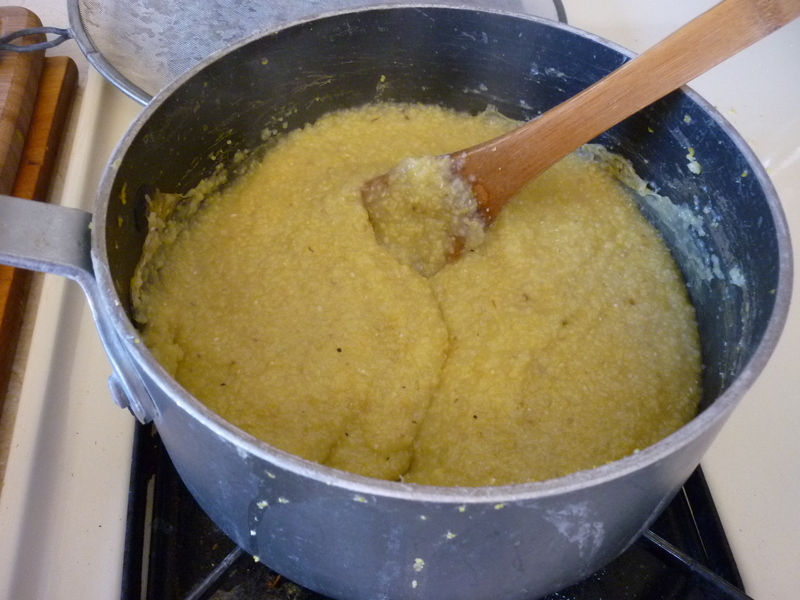 Here is one cup of polenta. Stir constantly at first until the polenta absorbs the water evenly. Once it starts to thicken you will want a spatter guard on it. You should stir frequently, instead of constantly. Looks thick enough now. 25 minutes has elapsed. I have to confess that I’ve never had polenta outside of what I’ve made myself in my own kitchen. I’m assuming I’ve done it right because it tastes good. I’ve seen prepared polenta in plastic tubes at the grocery. It looks like you would slice the tube into rounds and then assemble the dish that way. Someday I may try that. 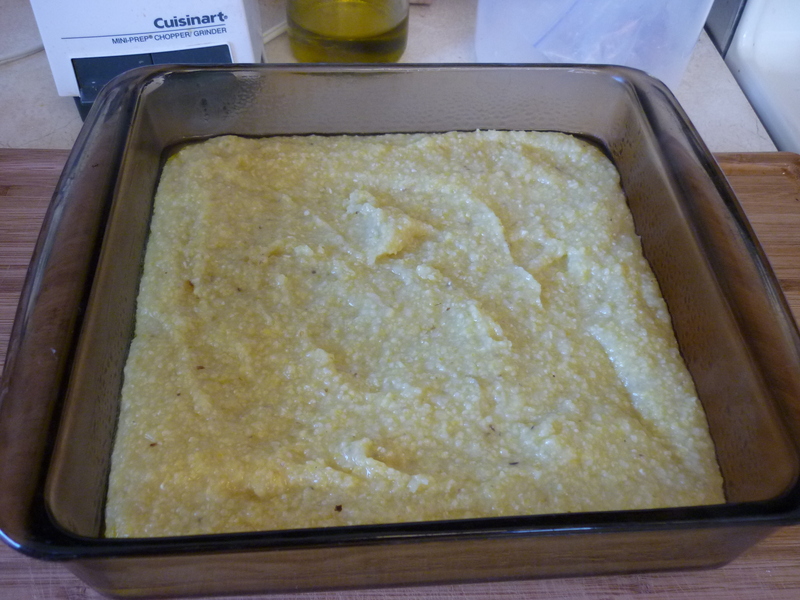 Cut the 8×8″ pan of polenta into 9 squares. Lift out each square, turn it so you see the short side, and slice in half. Now you have eighteen slices, roughly the same size. 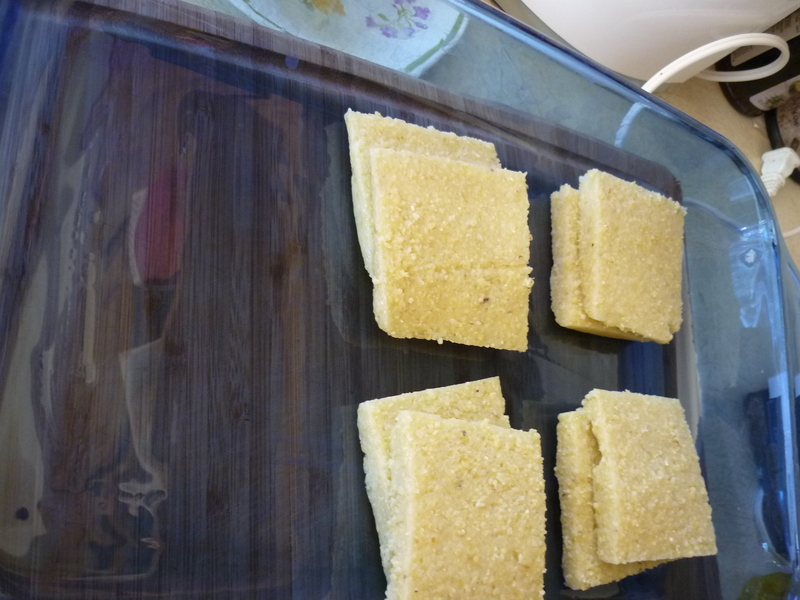 Lay nine of the squares out on a baking dish (a 9×13″ will work, but another size might work better-see below) which has been coated with olive oil. 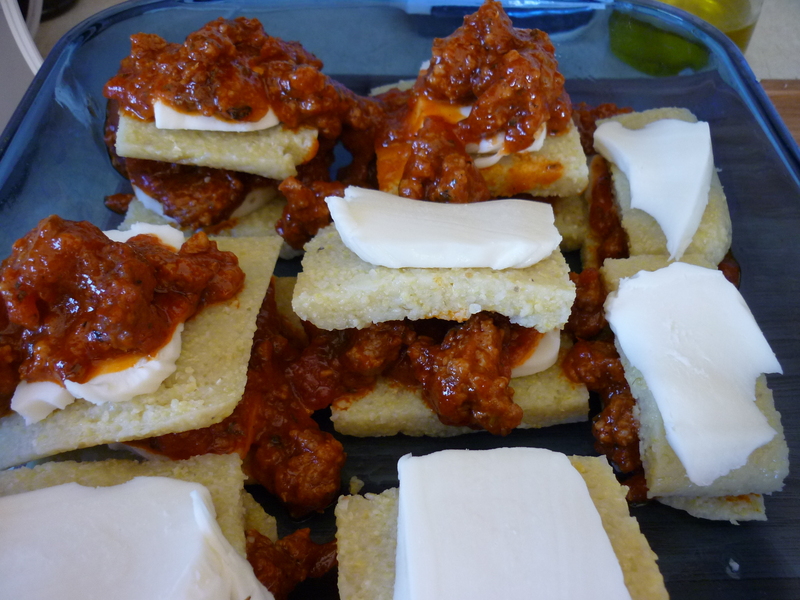 Top each polenta square with a piece mozzarella, then sauce. 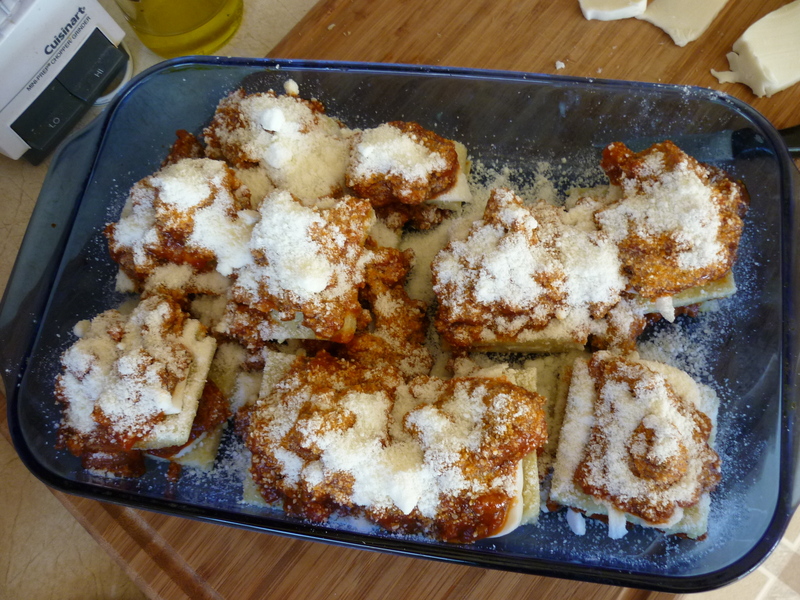 Then top the sauce with another slice of polenta, cheese, and sauce. Sprinkle the whole thing with Parmesan cheese. Bake at 350 degrees for about 45 minutes. 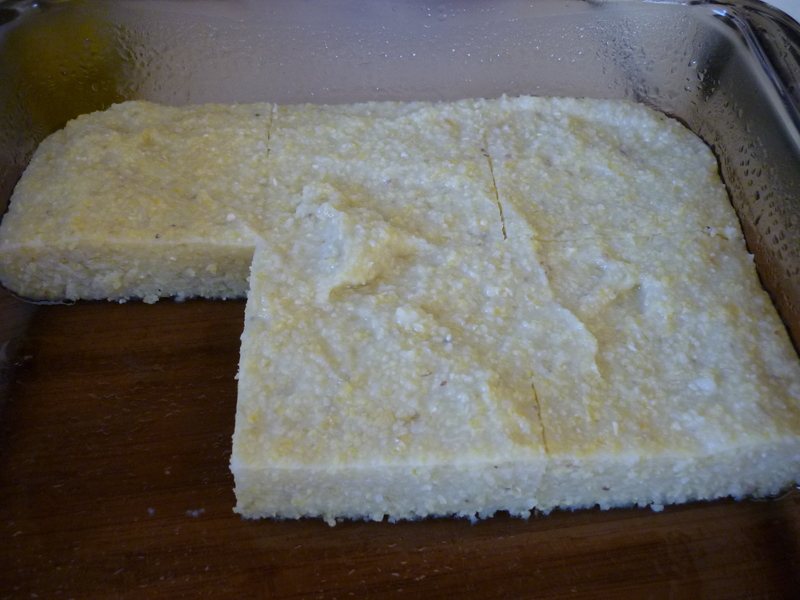 Cut polenta into squares and lift out of the pan. My sauce has BIG chunks of Italian sausage in it, so my little polenta stacks look a bit topsy-turvy. TASTES great. Doesn't present very well, though. Sigh. See what you can do. My nine polentas wouldn't fit in the pan so I split one in half, it's on the right side of the picture. Just before it goes into the oven. Serve! Goes well with Eggplant au Gratin.